Derwentia derwentiana (Derwent Speedwell) is a reasonably uncommon lowland species of erect herb (sometimes woody). It grows in a ranged of mostly moderately well watered areas. 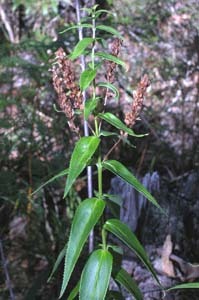 The leaves are opposite, simple, but with serrate margins and are usually about 5-15 cm long and 1-3 cm wide. 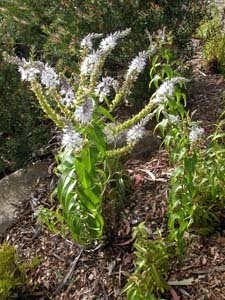 The flowers are in conspicuous racemes at the top of the stems.